9 month old Viha needs your help to survive. I thought my daughter was so strong, and there would be nothing a few injections can't fix. I was not prepared for this.” says Chairag, Viha’s father. 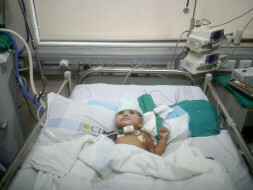 Early in January this year, Chirag and his family were coming back to Ahmedabad from a short trip to his relatives’ place when they noticed that Viha was having trouble breathing. They took her to the doctor the next day, thinking it was probably a bad cold or an infection. But nothing had prepared them for cancer. Viha was tested and the reports showed an orange-sized tumour near her heart. The doctors told the heartbroken parents that she would need prolonged chemotherapy in order to survive. Viha was a healthy baby, with never a sign of illness. When Chirag and his wife Hinal took her to the doctor, he suspected cancer. But by then, Viha had contracted pneumonia and was too weak for a biopsy. They started off with her pneumonia treatment right away. Once she recovered enough, more tests were done - X-Ray, CT Scan, and biopsy. When the test results came out, she was diagnosed with cancer. Shortly afterwards, her heart stopped beating and she had to put on the ventilator. Within the span of a few days, Viha's condition had deteriorated and she was in the ICU on ventilator support, for her heart kept stopping every one or two days. Her parents were shattered to see their baby girl at this stage, fighting for her life. Then her chemotherapy sessions started and her platelet count began to drop alarmingly. Moreover, the treatment being targeted to her tumour slowly started to affect her kidney and she couldn't urinate anymore. Soon she was put on dialysis too.Even in her critical condition, little Viha is a fighter. "For us, doctors are the Gods on earth. We can only pray for our daughter to get better and come back to us. Initially, the doctors were losing hope, but now she's responding to treatment and they say there's still hope." At an age where children are playful and learn new things, baby Viha is battling for life against cancer, pneumonia and kidney malfunction. Due to her critical health condition, she's being fed through nasal feeding tubes in order to provide her with the right nutrition. Although she's still on ventilator support, she's showing signs of improvement and the doctors are hopeful that with the timely administration of the necessary treatment, Viha will completely recover from this illness. But in order for this to happen, Chirag needs to have the necessary funds. Chirag has a small business in Ahmedabad that doesn't provide him with regular stable income. Being the only breadwinner of the family, he also has to manage all the household expenses in the meagre income he makes. To make matters worse financially, Chirag's younger brother is bedridden due to a prolonged illness and hence unfit to work. All these expenses don't allow him any money to spare for the mounting costs of his daughter's treatment. So far he has spent over Rs 10 lakhs towards Viha's treatment by mortgaging his wife's jewellery, borrowing funds from friends, and money lenders at a high-interest rate. But now his reserves have run dry again and he can't afford to pay for his daughter's treatment anymore. At this critical stage, if Viha can't get the medical attention she needs, she will succumb to cancer. In order to give a fair second chance at life to Viha, Chirag needs your help. Your contributions can make the difference between life and death for this little girl. 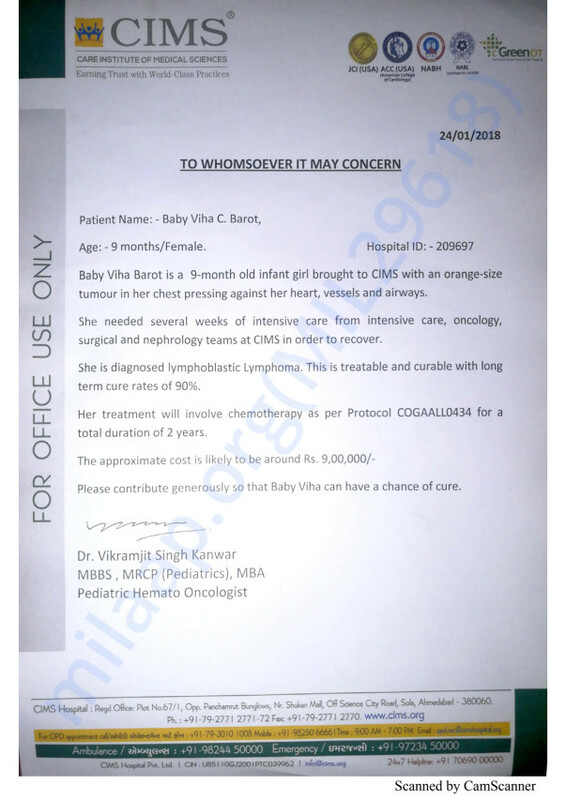 This is with regard to Baby Viha, a 9 month old girl who presented to us with massive mediastinal mass and was subsequently diagnosed with T-Cell lymphoblastic lymphoma and suffered multiple medical complications requiring intensive care with dialysis, prolonged ventilation, nasogastric feeds and transfusions. She has now completed induction and initial consolidation therapy per COG AALL0434. Her CSF is clear, her tumor has shrunk, and she is well enough discharge home to continue interim maintenance chemotherapy on an outpatient basis. She retains her tracheostomy and will need NG tube feeds and physical therapy once she is home. I am very pleased with how this young girl has done. She obviously has a long road ahead of her and will need a total of two years of chemotherapy. but overall we are cautiously optimistic she has an 80-90% chance of long-term cure. Thank you for the wonderful support that you have shown towards Viha. She is doing better now compared to earlier and is slowly recovering. She is still under observation in the ICU. She has successfully completed 4 cycles of chemotherapy so far and has had no side effects as such. The doctors suggest that she will have to undergo the treatment for about another two years. She is still on the ventilator support and her dependence on the ventilator has been reduced from earlier to 10% at present. The doctors suggest that if she recovers at this pace, then she will be off the ventilator soon. God Bless you. Please recover soon.